I hope everyone is recovering from the mayhem that is Thanksgiving weekend. We at Virginia Beer Blog enjoyed the time spent with friends, family, food, and amazing Virginia Craft Beer. 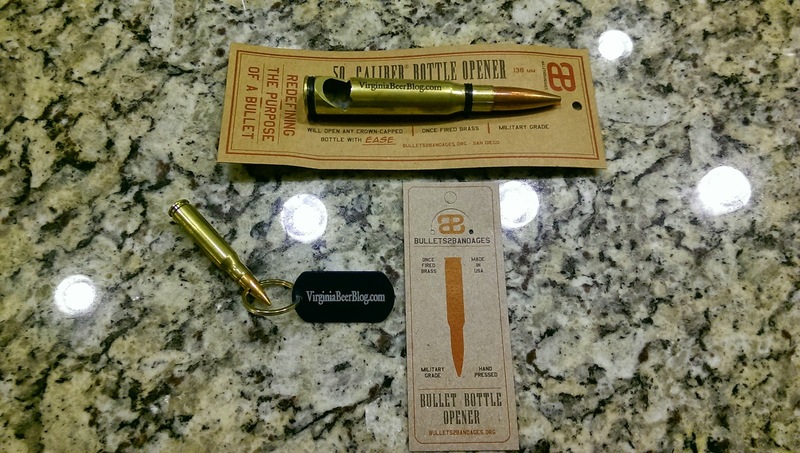 After Thanksgiving dinner round three, Sam and I had a moment to sit down, enjoy some brews, and marvel at our newest gadgets: two new, customized bottle openers from Bullets2Bandages. Bullets2Bandages was founded in 2011 by two former Navy Explosive Ordnance Disposal officers, and joined a year later by another US Naval Academy classmate who served as a Marine Corps infantry officer. During their 3+ years in business, they've donated at least 15% of their profits to veteran charities on an annual basis, to include partnerships with the Travis Manion Foundation, MARSOC Foundation, 31 Heroes Project, Wounded Wear, and the Red Circle Foundation. 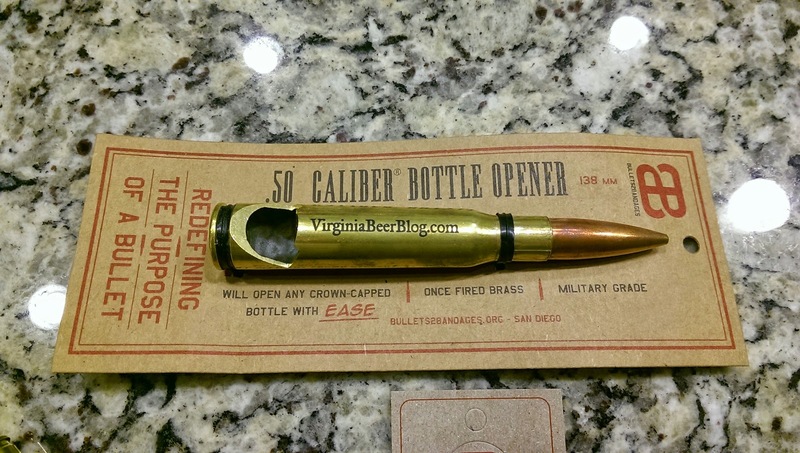 The .50 Caliber Bullet Bottle Opener is about as solid as a bottle opener gets and will make for one hell of a conversation piece when you have company. As you can see, the product itself can be customized for businesses and individuals alike. There is an optional Custom Engraved Case that looks great, but I would caution against it, as it appears to add $20 to your total which, in some cases, is more that the bottle opener itself. Being slightly smaller, the 7.62mm Keychain Bullet Bottle Opener didn't knock the bottle top off with ease like the .50 Cal, but it did the trick just fine. It doesn't grant the leverage of it's larger brother, but the trade-off is for mobility. Coming on a key chain, this is definitely a perfect stocking stuffer, and it goes towards a good cause. Parkway Brewing's Bridge Builder Blond was the first test subject. Popping with style and ease. It should also be noted that Bullets2Bandages' initial sales were more directly to active duty military and veterans. In recent years they have branched out to multiple retailers, such as Cabela's and they are now offered in 60+ Craft Breweries and Pubs across the United States. These items can be custom ordered for businesses through the Whole Sale tab on their site. A bottle of 3 Brothers Brewing's The Great Outdoors helped us test out the 7.62mm key chain. If you're looking for an interesting gift for the beer connoisseur in your life, visit Bullets2Bandages' website to see what they're about. If you find something you like, you'll be helping give back to those who have served. 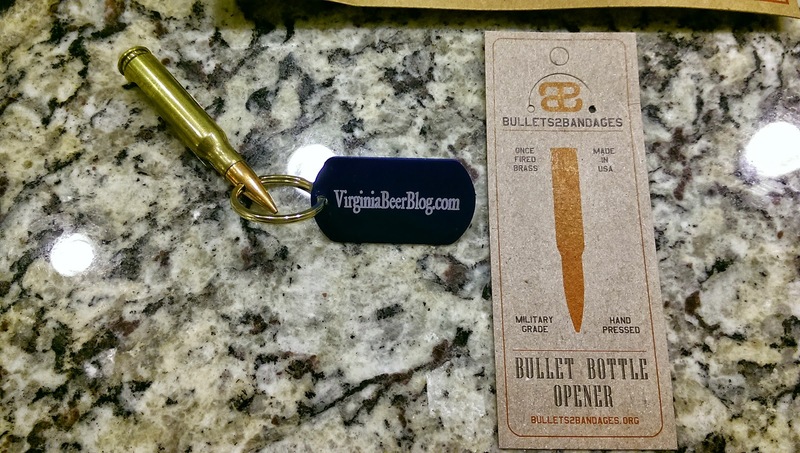 Blogger Disclosure: Virginia Beer Blog received free product from Bullets2Bandages.